The RIP-IT Defense Ponytail Strap is both ultra-flexible and adjustable. The universal size is made to fit almost any head in the Rip It Defenders Face Guard. You can rely on the ponytail strap for optimum comfort even if you change masks or hair styles. When you’re on the field and killing the game, you don’t have time to worry about your hair. This strap is designed specifically so you can loop your ponytail through the back. This keeps your hair out of your face and off your mind. This ponytail strap is specifically designed as a replacement for the Rip It Defenders Face Guard. It fits any size of the Rip It face guard and provide a like-new fit that is secure and comfortable for playing. At RIP-IT, we understand that team sports are an integral part of confidence building and help provide girls with the skills they need to be successful. We make quality products that honor this commitment. That’s why each Defense Pro is backed with a $5,000 Peace of Mind Policy, which will help cover your medical costs in the (seriously unlikely) event of a dental or nose injury from a softball striking the fielder’s mask. Package includes (1) RIP-IT Defense Ponytail Strap Replacement. To register for the Defense Pro $5,000 Peace of Mind Policy, see RIP-IT’s website within 30 days of purchase. PONYTAIL FRIENDLY – When you're on the field and killing the game, you don't have time to worry about your hair. This strap is designed specifically so you can loop your ponytail through the back. This keeps your hair out of your face and off your mind. RIP IT DEFENDERS FACE GUARD – This ponytail strap is specifically designed as a replacement for the Rip It Defenders Face Guard. It fits any size of the Rip It face guard and provide a like-new fit that is secure and comfortable for playing. RIP-IT DEFENSE QUALITY – At RIP-IT, we understand that team sports are an integral part of confidence building and help provide girls with the skills they need to be successful. We make quality products that honor this commitment. 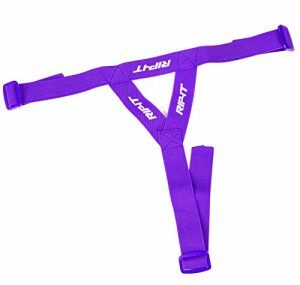 PRODUCT SPECIFICATIONS – Package includes (1) RIP-IT Defense Ponytail Strap Replacement. To register for the Defense Pro $5,000 Peace of Mind Policy, see RIP-IT's website within 30 days of purchase.